We’ve provided this page for those that decide they’re just not in the mood to make their own set of teeth. Below you’ll find a list of websites and products related to vampire fangs and other accessories. Follow the links to find out where you can purchase these on the web. If you another great resource that we haven’t listed, contact us and we’ll post it as soon as we’re able. We’d also love to receive any feedback you might have on the products listed here. Enjoy! 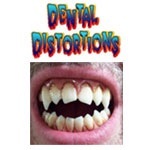 Dental Distortions makes the best FX dental appliances on the market today. Why Dental Distortions? Other companies in this business have targeted the cheap low-end market, yeilding a low-quality ‘disposable’ product. By maintaining a high level of quality and hyper-realistic detail, Dental Distorions has created a line of FX dental products for the high-end market. Their teeth look REAL. “Simply the finest, most realistic fangs available.” Not much more can be said about VampFangs. If you’re looking for a quality set of fangs that you can easily fit to your mouth, this is the place to find it. They’ve got dozens of styles to choose from, even retractable fangs! You won’t be disappointed! Whether you’re planning on becoming a witch, vampire, or any evil creation you can conjure up, these Fangtastic Fangs will add the much needed suspenseful touch to your costume. This set of Fake Costume Teeth features two vampire fangs that are perfect for making you look as horrifying as possible.